Many hikers have probably seen this strange looking plant growing on the rocks in the Cape Mountains and wondered what it is. It looks very much like a moss and often has a similar habit, yet it bears white flowers. Can it be a daisy? Small, tufted, copiously branched moss-like plants up to 70 mm tall. Branches densely leafy throughout. Leaves sessile, linear. Flower heads radiate with 6-7 white ray florets and 7-9 wine-red disc florets. Bracts brown. Pappus present, white, plumose. Flowering October to January, occasionally in August, September and February. 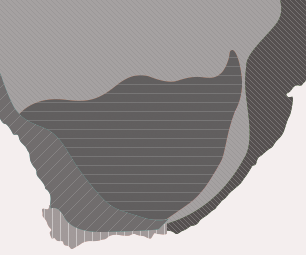 Distributed in the Western Cape, ranging as far north as the Cederberg and eastward to the Klein Swartberg. 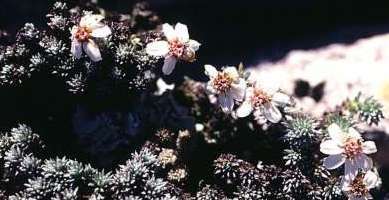 It grows in shallow soil in rock crevices at altitudes ranging from sea level to 2 250 m. The plants often grow on exposed rocks and can tolerate extreme climatic conditions: strong winds, cold, snow and drought. The name Bryomorphe is from the Greek bryon: moss, and morphe: form. 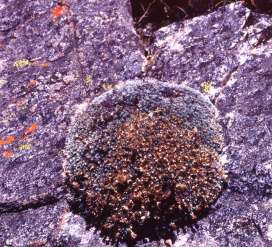 An 'Alpine' plant with moss-like habit (Jackson, 1990). This is a monotypic genus also known under more recent names such as B. zeyheri and B. lycopodioides. Little is known about pollination. Plants are specially adapted to survive in extreme conditions. They are well anchored in rock crevices, have a compact streamlined growth form, narrow leaves that are densely packed and have a densely woven hair-skin to prevent water loss. Seeds are probably dispersed by wind. Plants are not known in cultivation. If anyone can manage to cultivate this plant it will be a big attraction for alpine gardeners. To see it in its true beauty, have a look at the magnificent photograph in the book of Patterson-Jones (1997). Jackson, WPU. 1990. Origins and meanings of names of South African plant genera. UCT Ecolab, c/o Botany Department, Rondebosch. Koekemoer, M. Unpublished PhD thesis (RAU). 2002. Systematics of the Relhaniina (Asteraceae - Gnaphalieae). Patterson-Jones, C. 1997. The Cape Floral Kingdom. New Holland Ltd., Cape Town. ISBN 1-85368-481-3.